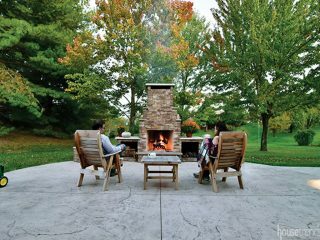 This back yard features a large bluestone patio with a fireplace and seating area adjacent to a custom Indiana Creek sandstone spa. 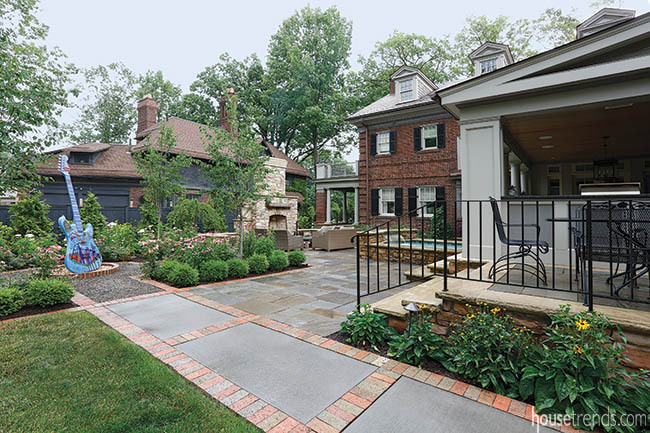 Step into Barb and Joe Necastro’s Cleveland Heights back yard and you will see green space so expansive, you might forget that you are in the heart of a fairly dense suburban neighborhood. Look again, and the formal garden might catch your eye. Or perhaps you spot the kitschy flamingo standing amid matching pink astilbe in bloom, or the bright blue oversized guitar like the ones made popular in downtown Cleveland that celebrate the Rock and Roll Hall of Fame. An astute observer will also notice a bit of southern charm in the not-quite-black wooden perimeter fence. The Necastros’ back yard is all these things and more and there is a lot to see in their new oasis. 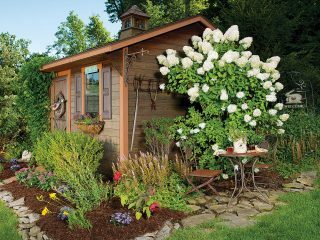 Designed by a friend and with friends in mind, this is a back yard that welcomes guests with a promise of hospitality and joy. 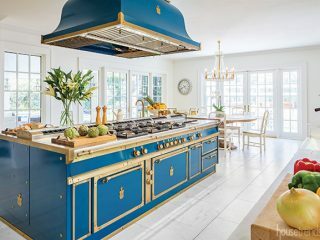 With connections to South Carolina, Barb and Joe imbued their Cleveland back yard with some southern touches, starting with their friend Julie Hensley. A South Carolina-based landscape architect, Julie provided the drawings and designs. “Julie did the high-level concepts and we took it from there,” said Bill Dysert, owner of Exscape, a landscape design-and-build firm. “We did the final specs, design development, construction drawings, architectural review and permitting.” Exscape’s work also included installing all the underground utilities for the new addition and all the excavation and site work, plus adding drainage and water lines. “I had a full-time project manager on site orchestrating that job,” said Bill. During the renovation, Barb and Joe lived in Tennessee for part of the time, spent time in South Carolina, and also time in a Cleveland-area rental before moving in to their finished Cleveland Heights home. “It is so much easier to work with clients who trust you and leave it to you to make decisions when they are not able. But Barb and Joe were also really great at making decisions when they could, and everything came together,” said Bill. There are areas for indulging all manner of outdoor leisure activities and it’s hard to identify a single focal point from its distinct features, but everything flows from the loggia. This architectural feature—a covered exterior gallery open to the elements and supported by columns—is accessible from the family room by way of a triple set of French doors. The loggia features a generous dining table alongside a built-in grill and kitchen area set on bluestone flooring with plenty of space for mingling and enjoying the view of the rest of the yard. An uncovered terrace bordered by an ornamental iron railing offers additional seating at a smaller table off one end of the loggia. 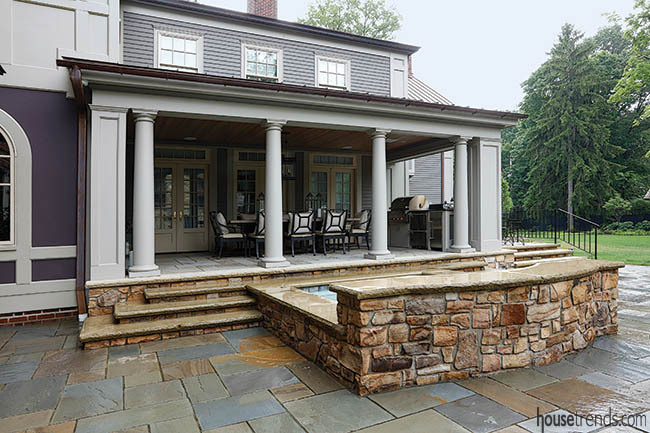 The transition area from the loggia to the rest of the yard is punctuated by a 10-by-10-foot custom spa with a waterfall and walls of Indiana Creek sandstone. A fireplace constructed of matching Indiana Creek sandstone looms in the space adjacent to the spa, where seating is available on a loveseat, individual chairs, and on the low stone walls that flank the fireplace. In the nearby landscaped areas, lavender twist redbuds, and weeping cherry trees ensure a colorful springtime display. Built-in speakers make it easy to bring music to the space. A hand-hewn beam serves as the mantle, and custom shoulders and a capstone of buff sandstone complete the wow-factor. The fireplace area is Joe’s favorite. 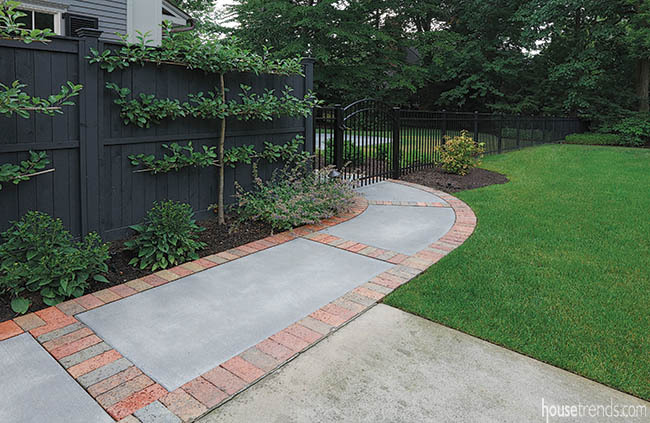 A brick-edged walkway of crushed bluestone winds through formal gardens of Knockout roses, blue coneflowers, boxwood and more. And in the center of this formal space sits that bright blue guitar. 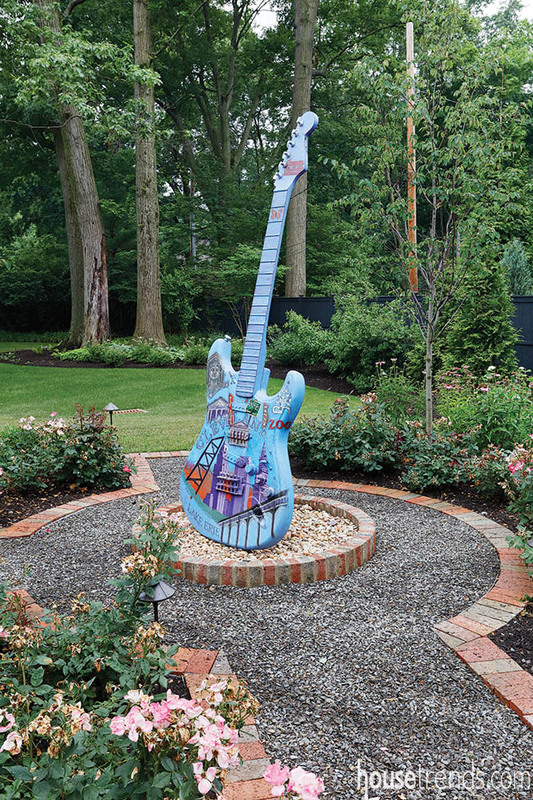 “Barb saw the guitars in Cleveland and thought they were cool,” said Michael Beightol, one of Exscape’s landscape architects. “She had to have one.” After a determined search, Barb located a damaged guitar and had a local fabricator repair and paint it. From this area, the Charleston Green perimeter fence is visible through arborvitaes that stand out against it. The color has its roots in the post-Civil War era. Legend says that the North provided black paint to the South for use in its reconstruction but black was too “funereal” for Charlestonians’ sensibilities, and they were too proud to use Yankee paint. They mixed the black with a little yellow and created what is now known as Charleston Green, popular on historic Charleston homes. The fence encloses the large lawn which includes several groupings of maples, oaks, a large spruce and a hemlock tree that Exscape Designs was able to save, creating a natural and loose perimeter. 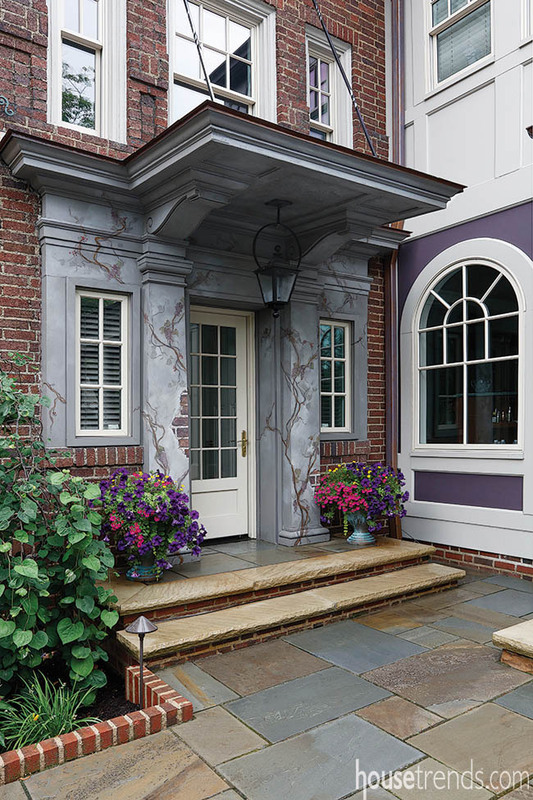 “This looks nice around the formality of the patio and loggia,” said Michael Beightol. Exscape removed about a dozen large trees that were too close to the house, and created new beds full of early-blooming bulbs, plus spirea, catmint, rhododendrons, hydrangea and other locally hardy selections. As the team forged ahead on the home and yard transformation, they also forged friendships with each other and with Barb and Joe. “When it was all done, we threw a big party for all the contractors who worked on it,” said Joe, who estimated the party attendance at about 100 people. This space, born in friendship, led to those 100 new friendships and promises a long future of more of the same.